Join Us ~ Join us at God's Tiny Angels in helping babies and teen moms in need. Membership once again open! Keep reading for more information. As we all are aware, times are changing. We have more and more babies born too early. Unfortunately many turn their backs and say, "It's someone else’s problem." 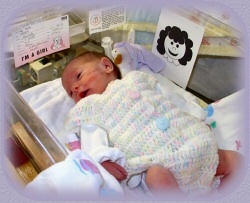 What if your baby was born too soon, and the hospital had just old, used blankets? Unfortunately many just look the other way. God's Tiny Angels provides material needs for those who need it in West Virginia and across the country. You may say, "Well I can’t crochet or sew." We say, "No problem!" Do you have those extra bottles of toiletry items, or that skein of yarn that's been in the closet since you were 10? Box it up and send it in. What about that great sale you saw the other day on diapers, bottles and pacifiers, or that box full of beautiful baby clothes at that yard sale which looked like they'd never been worn? You walked by because you thought you couldn’t use it! Well now you can. Help us make a difference today. Tomorrow will bring more new Angels and teen moms. Donate items such as baby clothing and supplies, new or gently used. Donate items such as supplies for crocheting and knitting, like skeins of yarn. Join our Yahoo Group and find out where we are currently delivering our donations. Start mailing!